Rainy Day Activities At Lake George RV Resort! No matter how well you plan, it seems that no vacation would be complete without at least one rainy day! Not to worry – there is always something fun to do at our unique lodging in Lake George! In addition to offering the best vacation rentals in Lake George, the extensive offering of on-site amenities provide more than enough fun to keep the family busy! Located near great horseback riding stables, hiking trails, and bike paths – Enjoy excellent amenities at our lodging in Lake George. 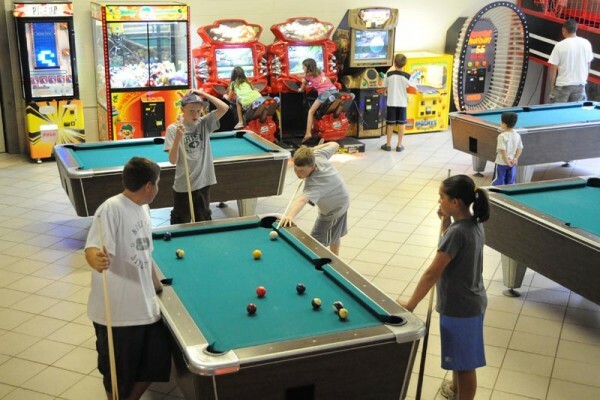 Video arcades and 10 pool tables provide a welcome distraction for kids and adults alike. Take advantage of the inclement weather and visit the adult fitness center, or watch a movie at one of our two indoor movie theatres. For one of summers’ all-time favorite rainy-day activities, there is a huge 5000 sq. ft. screened Bingo Pavilion! Our well-known French Mountain Playhouse is home to some of the area’s best professional live entertainment venues, with performances the whole family can enjoy free of charge! Lake George is overflowing with all types of activities, events, and excitement even on the soggiest of vacation days! The Village of Lake George has many arcades to choose from, accommodating all ages, and the House of Frankenstein Wax Museum is a great choice for indoor fun! Bowling is also available and always a hit with kids of all ages. The Great Escape and Splashwater Kingdom is filled with endless opportunities for fun, even when the weather is a bit shy of perfect! Shopping is one of the best components of a good rainy-day activity plan. Hop aboard our own Lake George RV Park Trolley for a ride to the Outlet Center, with over 100 stores and restaurants for you to browse. From there you can catch the Municipal Trolley to the village of Lake George, or ride into Glens Falls and visit the Aviation Mall or the Hyde Museum. Take in a movie, or a live production at the Charles R. Wood Theater in downtown Glens Falls. The Adirondack Sports Complex (the “Dome”) offers an indoor driving range for golf and batting cages as well. Visit one of the area’s many museums (link to museum pg.). Give your kids a treat at the The Fun Spot in Queensbury, where they can play Laser Tag, do some roller skating, or jump on a Go-Kart for an exciting fast-track experience! So…what are your chances of a rainy vacation day? No one knows for sure, but you can check to see what our seasonal weather averages are at ourLake George Weather Center! No matter what the weather, our lodging in Lake George will provide you with a memorable holiday retreat amid exceptionally comfortable surroundings. With our luxurious vacation rental accommodations and extensive amenities, your idea of Wilderness lodging in Lake George will never be the same again. Discover for yourself why generations of families return to our luxurious,Vacation Destination Resort year after year!